(23139.G223, John Dunning Political Collection, OHS). HARRIS, FRED ROY (1930– ). On November 13, 1930, future U.S. Sen. Fred Roy Harris was born to Fred Byron and Eunice Alene Person Harris in a two-room farmhouse at Walters, Oklahoma. The only boy in a family of three children, he grew up on a farm, and when he graduated from Walters High School with honors, he had been named state champion of the Future Farmers of America. To meet expenses at the University of Oklahoma he worked as a part-time janitor and as a printer's devil. He majored in history and political science, securing a bachelor's degree in 1952. At the university law school he served as administrative assistant to the dean and was successively book editor and managing editor of the Law Review, which in its August 1956 issue carried his first published article. He was awarded an LL. B. degree with distinction and was admitted to the bar in 1954. After receiving his law degree, Harris practiced in Lawton and in 1956 founded the firm of Harris, Newcombe, Redman, and Doolin. He engaged in general civil practice as his firm became one of the largest and most successful in southwestern Oklahoma. He resigned in 1964 when he was elected to the U.S. Senate. Politics had long interested Harris. While a student in Norman, he sought to represent his home district in the state legislature. He lost by thirty-five votes, but in 1956 he won election to the state senate and became the youngest member of that body. Over the next eight years he served or chaired all major committees and introduced much important legislation, including a measure for local industrial financing. He sponsored a measure that created the Oklahoma Human Rights Commission to prohibit discrimination in state employment. Harris also chaired the Senate Democratic caucus, and on the basis of his record he was chosen as Junior Chamber of Commerce Outstanding Young Man of Oklahoma award in 1959. In 1962 Harris sought the Democratic nomination for governor. He finished fifth in the primary. Two years later he proved more formidable in his bid to complete the unexpired term of Oklahoma's U.S. Senator, Robert S. Kerr. After Kerr's death on January 1, 1963, Gov. J. Howard Edmondson resigned to serve, by appointment, as U.S. senator until the next state and national election. At the Democratic primary on May 5, 1964, he out-polled Harris, former governor Raymond Gary, and a minor candidate (Willard Owens). Since no candidate had a majority, a run-off between the two top contenders was required. On May 26 Harris secured the Democratic nomination, defeating Edmondson by almost a hundred thousand votes. His Republican opponent, Charles "Bud" Wilkinson, was the popular and much admired football coach at the University of Oklahoma. 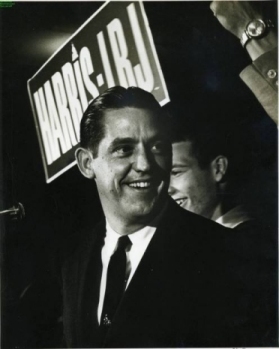 Harris benefited by close ties to the Kerr family, and in the November 3, 1964, presidential election the landslide victory of Lyndon Johnson over Barry Goldwater was a factor in Harris's close victory. He defeated Wilkinson by 466,782 votes to 445,392. At age thirty-three Harris was the youngest senator-elect in the history of Oklahoma. In his freshman year Harris presided for almost 120 hours over sessions of the Senate, more than any other member including the vice president and president pro tempore. He answered almost every roll call and had one of the highest voting records in the chamber. In addition, he was the author or co-author of more than a dozen bills introduced during his first session, including a measure creating a Regional Development Commission for the Ozarka Region, encompassing eastern Oklahoma, western Arkansas, and southern Missouri. He also served on three major Senate committees and nine subcommittees. He was one of the very few freshmen senators ever to be named chair of a subcommittee. John McClellan, chairman of the Senate Government Operations Committee, named Harris to chair a Special Subcommittee on Government Research on August 20, 1964. His goal was to bring some accountability in federal research and development programs costing about $15 billion a year. One result of his probing was a bill calling for an independent agency to approve social science research projects and to screen them for connotations that would give the United States an unfavorable image abroad. Working through his subcommittee, Harris also endeavored to help develop a national science policy. In 1965 the United States Junior Chamber of Commerce named him one of the Ten Outstanding Young Men of the Year. Throughout his senatorial career Harris promoted rural development and was a firm friend of agricultural programs as a way of slowing rural migration to urban areas. As a member of the Public Works Committee he furthered his predecessor's goal in guiding through Congress legislation carrying forward the Arkansas River navigation program, and tributary development, including the construction of dams in Oklahoma. Like all members of the Oklahoma delegation he worked to further Indian health and community development. Early in his career he also exhibited an interest in foreign policy, seeking to curtail assistance to countries that violate human rights or manifest hostility to the United States. In 1966 Harris's reelection was opposed by Oklahoma City attorney Pat J. Patterson. Among other issues Patterson sought to embarrass Harris by endorsing the constitutional amendment proposed by Sen. Everett M. Dirksen allowing school boards to provide for prayers in public schools. The proposal garnered enthusiastic support in Oklahoma, but it did not win Harris's approval. He explained his position in a letter sent to every fifth resident: "I believe in the separation of church and state and I believe prayer and Bible reading should be voluntary." On November 8 Harris handily defeated Patterson by 343,157 votes to 295,983. Following his election Harris, joining his colleague Birch Bayh and their wives, visited at his own expense several countries in South America to familiarize himself with Latin America and the effect of federal aid projects. In the Senate he remained a firm supporter of Lyndon Johnson's Great Society programs. After a series of devastating race riots, in March 1968 the president appointed Harris to the National Advisory Commission on Civil Disorders. He quickly became one of the most active members and was deeply concerned about the plight of economically deprived inner-city African Americans. Shortly thereafter Harris broke with the administration over its Vietnam policy, emerging as a critic who soon was calling for troop reduction and then for withdrawal from military operations in Southeast Asia. Despite this disagreement Hubert Humphrey, who as vice president sought to further Harris's career by appointing him to select committees with overseas assignments, seriously considered him as his running mate in the 1968 presidential campaign. Selecting Edmund S. Muskie for the post, Humphrey asked Harris to co-manage his unsuccessful campaign for the presidency against Richard M. Nixon. Before leaving office, Humphrey chose Harris to chair the Democratic National Committee, a post he held for about a year, resigning early in 1970. As head of the DNC he selected two committees designed to open the party to more active participation by minorities and women. While seeking broader participation in the party, he also had to deal with mounting dissatisfaction on the part of Southern Democrats, who were leaving the party of their fathers in increasing numbers. Meanwhile, in the Senate he played a major role in restoring to the Taos Pueblo its sacred Blue Lake lands, in championing the cause of Alaska Eskimos seeking to retain a large portion of their land claims, in protesting the wholesale slaughter of seals, and in changing the roles of the Democratic caucus to exclude senators who did not support the party's presidential nominee. At the same time he became a sharp critic of the policies pursued by the Nixon administration, and he called for a fairer distribution of wealth and income and power by insisting that government serve the people and not the special interests. His criticisms merged into what he called the New Populism. It became the basis of his two abortive runs for the Democratic presidential nomination in 1972 and 1976. Lack of funds slowed his campaigns, and Harris at an early date withdrew his candidacy. After dropping out of the presidential marathon in 1976, Harris departed the political scene. He reinvented himself as a professor of political science at the University of New Mexico, where he was an effective teacher and author of several best-selling textbooks. In the late 1990s he served as chair of the New Mexico Democratic Party and in 1999 launched a new career as a writer of fiction. Fred Harris, Alarms and Hopes: A Personal Journey, A Personal View (New York: Harper & Row, 1968). Fred Harris, Now is the Time: A New Populist Call to Action (New York: McGraw Hill, 1971). Fred Harris, Potomac Fever (New York: W. W. Norton, 1977). Richard Lowitt, Fred Harris: His Journal from Liberalism to Populism (Lanham, Md. : Rowman & Littlefield, Publishers, 2002). Richard Lowitt, "Harris, Fred Roy," The Encyclopedia of Oklahoma History and Culture, https://www.okhistory.org/publications/enc/entry.php?entry=HA033.